A few weeks ago, I was sitting in the cold chair in the waiting area of the US Embassy. It was like joining a beauty pageant and waiting for your turn to be interviewed. I have never joined any beauty pageant, but I know it was nerve-wracking. I keep on telling my friends how I dread the US Visa application interview. Before the interview I felt like having panic attacks. It was much maddening than my final interview for my first job. I don't want to scare you, but the truth is, I was crazy scared!!! For someone who has traveled to different cities and visited some first world countries, I only have fancy passport stamps to back me up for my interview. For some, they thought I have higher percentage of getting my application approved; but I know a few who have been in different countries but still got denied. What makes me special? I didn't know how to start this blog entry, and although I have already gotten my US Visa, things in my head are scattered and thoughts are just flowing freely - I am typing them in this blank space. Let me start with the application steps. Here are tips on how to apply for US Visa. How to Apply for US VISA? 1. Register and submit application online. 2. Pay US Visa application via BPI. Make sure that you pay your visa before scheduling an interview or getting to the embassy. There were two applicants who went for an interview and during the pre-screening, the attendant questioned their application and advised them they have not paid the fees yet (she was on microphone for the whole office to hear!). Ouch. 3. Schedule your application interview online. I would advise that you book earlier and always check the availability. You can re-schedule your US Visa interview only twice. When I booked my schedule, the earliest appointment was May 4. I called the hotline to request for an earlier appointment. The girl said that I should check online because there might be slots that would open. I did, and found a slot on April 27th (and I took it!). 4. Come prepared for the interview. When I say come prepared, come with support documents and all requirements. You don't need to come in formal or business attire. Wear comfortable shoes. Just wear smart casual and be presentable. Mobile phones and electronic gadgets are not allowed. Leave them at home when you are coming on your own. 2. Printed copy of your appointment schedule (they will check this on the first line outside the embassy). 4. 2x2 Picture per the US Visa Application requirements (I have a scanned picture printed in the DS-160 but on that picture, I was kind of smiling. During the pre-screening, they asked for a different picture - thankfully I came prepared). I love that US Embassy did not specifically listed support documents required for the interview. I just thought I would come prepared to support my strong ties in the Philippines. I have secured bank statements and brought financial documentation. If you are employed, I would suggest you bring a copy of your Leave Application to support the claim that you are coming back after the trip. After the pre-screening, we waited for our turn to be called and interviewed by the consul. We were given numbers when we got in the embassy, and these numbers would be flashed on the screen randomly. I felt that it was worse than a beauty contest. You sit there, waiting for your number, not knowing when you would be interviewed. I was so nervous and I kept on taking deep breaths. Like what I always do, I need to fake my confidence. Several applicants have left the windows and you would know by the look on their faces if they got approved or not. I was thinking, I only had a few minutes to determine my faith. I was seating there and I wouldn't know if I would leave smiling or not. I was trying to attract the good forces of universe and praying hard. While waiting, I got a little bored and prayed for my number to show up in the screen. It did! Off to window 2, I stood there while a woman was still being interviewed. On the next window was a Korean Consul. I was not sure if she's the famous Korean Consul of the US Embassy who is prominent of denying every application she received. I was quite happy not to be called under her window. A few minutes after.. it was my turn to defend my case. Here's the secret of how US Consuls evaluates the application - well, they are trained to deny all the applications they receive - and one must defend his/her case and prove he/she is worthy of US Visa to get approved. How do we do that? You have to establish good ties in the Philippines. Ruth: Good morning, how are you? Consul: I am good, oh, it is a Monday. How are you? Ruth: I am good. I can see, it is pretty busy in the office. Consul: So what's your purpose of the travel? Ruth: I received an invite from (I cannot disclose yet) and I am traveling with other media and local network. Consul: You should have applied for a Press Visa. Ruth (thinking quick): Well, I am not actually connected or employed to any network now, and I have my website where I write about my travels. Consul: It shows in the record that you previously applied for a visa? For banquet services? Ruth: That's right. I think that was in 2006. But I think that is a good decision by the Embassy because I was young then, and at least I get to spend time with my family here in Manila. Consul: What is your current job? Ruth: I am doing (I cannot disclose.. because I am secret agent!) and I am also maintaining a blog where I write about my travel stories - and that's how I got invited by (my sponsor, I cannot disclose yet). Consul: Can you give me a minute? ** She left the window. I was thinking, probably she asked a colleague how to handle such application, or she must be checking me out in the monitor evaluating how I was behaving (nervous? scared?). She probably googled my name and checked my site. I kept calm and composed myself. I relaxed. I was totally faking it! When she came back..
Consul: Who is your sponsor again? Who is paying for the trip? Consul: Yes please (cheked the letter and typed something in the monitor). Ruth: Yes, you can say that. Consul: Have you been outside the country? Ruth: Yes, some Asian Countries - and Canada and recently, United Kingdom. Consul: When did you visit Canada? Ruth: It was in 2012. Consul: What did you do there? Ruth: I was sent by my former employer, IBM for business meetings. Consul: How long have you stayed with IBM? Ruth: Around 5 years. From 2008 to 2013. I left the company November 2013. Ruth: Manila, with my family. She then kept the passport and my application to her side. She did not return my passport! This is it! Consul: I am just wondering, do you earn anything from it? Ruth: Well, I wish they are paying me for this. But I always get asked the same question by my friends, and I always tell them that I don't earn much from the things that I do, I earn experiences. So I am really excited for this invitation! Consul: So how do you support yourself? Ruth: When I left IBM and decided on doing this (and my secret agent job), I have allotted a saving/fund to support myself for two years while doing this. (PS. I have my bank statement to show just in case she asked). Consul: We are giving you a visa because of strong travel history, but you have to come back after the trip alright? Ruth: Oh wow, thank you! Of course, I still have planned trips in the coming months. Consul: We will send you the visa in a week. Ruth: Awesome! So am I good to go? Consul: Yes, you are! Have a great day! Ruth: You too! Thank you! So what exactly happened during the interview? To tell you honestly, I was worried I would be denied in the on-set of interview. But during the course of interview, I made sure that I defended my case and established my ties in the Philippines. First, my family ties (I mentioned that it was good to be able to spend more time with family), financial ties (I mentioned I have fund to support myself) and economic ties (which is very weak in my case). But my previous travels did help in testifying that - I would not work in another country and I will be back here in the Philippines. She did not check my old passports and visas. 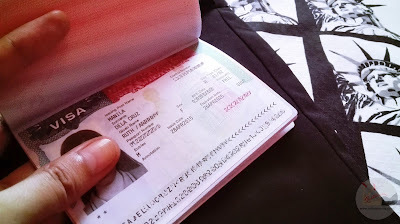 My current passport only has UK immigration stamp on it (my UK visa was even in the old passport). I think it helps that the interview is more conversational and relaxed. I did not sound desperate or hostile (answering one liners). If you are given a chance to speak, share and make it sound like a conversation - not an interview (and always say the truth). But don't forget to fake the confidence! Read here on how I got my UK Visa in 3 days!